On Friday night, the Muskegon Lumberjacks had a historic night in Wisconsin. The ‘Jacks are the top team in the USHL’s Eastern Conference for the first time in franchise history. With a 4-3 win in overtime over the Green Bay Gamblers on Friday, Muskegon secured the top spot in the East for the upcoming USHL playoffs, which start shortly after the regular season concludes on April 13. They extended their lead Saturday night, recording a 3-0 win in Green Bay. The Jacks are currently 40-16-3-1, with three games remaining in the regular season. On Friday, the ‘Jacks scored three power-play goals and Alex Yakovenko scored the game-winner in overtime. Balanced scoring has led to the exceptional run by the Lumberjacks, as the team boasts four players who have more than 40 points and 10 players who have cracked the 25-point plateau on the season. Forward Egor Afanasyev leads the way with 58 points in 57 games; Yakovenko is five behind. Grand Blanc native Bobby Lynch checks in at No. 3 with 52. 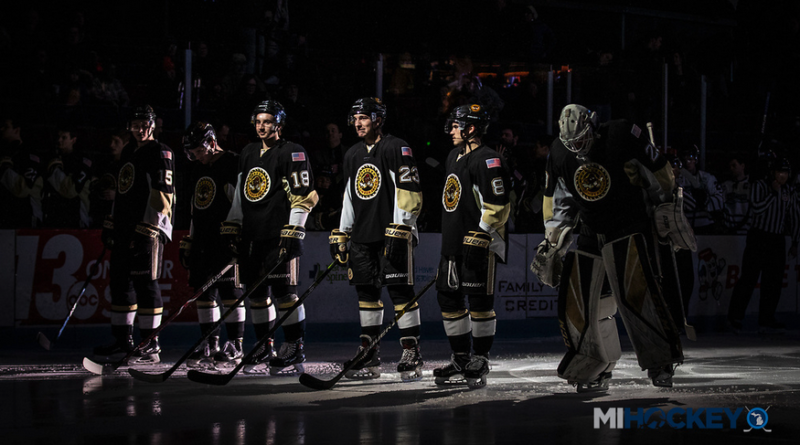 Western Michigan commit Brandon Bussi continues to shine between the pipes for Muskegon, as well – the ‘Jacks netminder holds a 33-12 record with seven shutouts, a 2.44 goals-against average and .915 save percentage. With the conference championship, the Lumberjacks secure a first-round bye in the playoffs. The No. 3, 4, 5, and 6 teams in both conferences play first-round series (3v6, 4v5) while the top two teams jump ahead to the second round. As it stands today, the Youngstown Phantoms would host the Dubuque Fighting Saints while the Cedar Rapids RoughRiders would host USA Hockey’s National Team Development Program in the two Eastern Conference match-ups.